Our values have become deranged if the concept of confidence can now be demonstrated by plus-size women flaunting bikinis. These days, plus size women who pose at the beach or boardwalk in a bikini are hailed as bastions of self-confidence. We can’t ignore the reality that for some overweight and even smaller women, feelings of nervousness or uneasiness will ensue if they step onto a beach wearing a bikini. 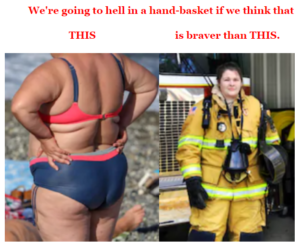 But if one day, such a woman decides, “Oh screw it, I don’t care what anyone thinks of my body!” and wears a brand-new bikini to the beach … SO WHAT. Yes, so what. Let’s see this for what it is. It should be a “so what” moment to anyone who doesn’t personally know this woman. Instead, the decision to do something that’s been done for many decades – wear a bikini where it’s supposed to be worn – is lauded as an act of super confidence. Plus size women and smaller self-conscious women have been finally “working up the courage” to wear certain fashions for decades. The phrase, “work up the courage,” has been overused, such that it’s even used when a brunette woman finally decides to go blonde or a woman finally decides to get a tattoo. The phrase is a mainstay in the English vernacular. Not surprisingly, “work up the courage” has been used in the body positivity movement when it comes to bikinis. This has led to the association of high self-confidence with big women wearing bikinis. A full figured woman posing publicly in a bikini, even though YOU still aren’t “ready” to do this, doesn’t mean she has more confidence than you. She simply feels more at ease with a particular fashion choice than you do. Period. Nothing more. Just because this woman doesn’t care what anyone on the beach thinks of her swimsuit choice, doesn’t mean she has loads of confidence. For all we know, your plus size idol has very little confidence WHERE IT COUNTS: day-to-day life. This includes the workplace, how she responds to a fender-bender, what she does if someone cuts ahead of her in a long line, what she does if she suspects child abuse next door, and what she’d do if she saw a man trying to pick the pocket of her mother. You have NO idea what the confidence level of your body-positive role model is – beyond that fraction-of-a-second snapshot. Maybe just before the latest Instagram picture was taken, she was allowing her seven-year-old son to boss her around for all you know. And even if your hero DOES have loads of self-confidence in the real world – you can’t possibly assume this simply because she’s okay wearing a bikini and you’re not. As far as you know, your favorite bikini Instagram star would lack the confidence to productively respond in a crisis – and instead, freeze and scream. The bikini amounts to nothing. It doesn’t wield power nor the ability to stand up to adversity. A BIKINI IS JUST A PROP! What Is the Science Behind the Bikini and Self-Confidence? • Evidence is lacking that wearing a bikini will turn a meek woman into a strong one. • Evidence is lacking that wearing a bikini is predictive of a woman’s confidence in the business world and community. If “confidence” means the ability to do something that many people are reluctant to do, then technically, the bikini bopo influencer has confidence in this one, very specific action. Can’t say it enough: so what. If you want to gloat in a plus-size stranger’s confidence, why not ratchet this up several notches and view full-figured women hang-gliding, inline skating, cycling in triathlons, competing in powerlifting events, climbing steep mountains, doing CrossFit or throwing karate moves? Just because a very big woman wears a bikini does NOT mean she’s any more confident than the next woman – large or thin – who keeps a cover-up over her one-piece swimsuit. If you ever find yourself on a beach in a cover-up, near a very big woman in a string bikini – don’t EVER feel that your confidence level is inferior to hers. Don’t EVER. Her bikini is none of your business; your cover-up is none of hers.